It seems like it's been a while since I've opened up a blaster of Donruss, but this is a very familiar product for me as it is something that is very affordable and easy to find. Finding a jersey hit in these blasters is pretty easy common, so there's a good chance there will be one in this box. Just like with many of Panini's first-year-back products, Donruss was meant to be a familiar brand to seasoned collectors. There were some good things done in Donruss, but nothing that really stuck or stood out. It was a product that only lasted one year, but Panini did end up using the brand to make special cards for release at card expos. Blasters of Donruss are easily available online. Even though this product is a five years old now, they still make a fun and affordable break for just about any collector to purchase. I personally would rather open one of these than quite a few other products that are available out there for purchase. Let's just hope for a good hit! This was a pretty interesting blaster of Donruss. Donruss is a product that usually has quite a bit of insert cards within, but this particular one didn't. Instead, it had three Rated Rookie cards. I remember all the rookies from back then, and it was fun to pull them again. It's too bad some of them didn't pan out to have big NHL careers. One thing that I definitely took notice of in this blaster was the amount of San Jose Sharks cards it contained. I felt like I got half the entire team in terms of base cards. Definitely not a bad thing as I enjoy pulling Sharks out of packs. 2010 was a very good year for the Sharks... just too bad they didn't make it all the way with such a great line-up of players. This was my only insert card out of this blaster box. 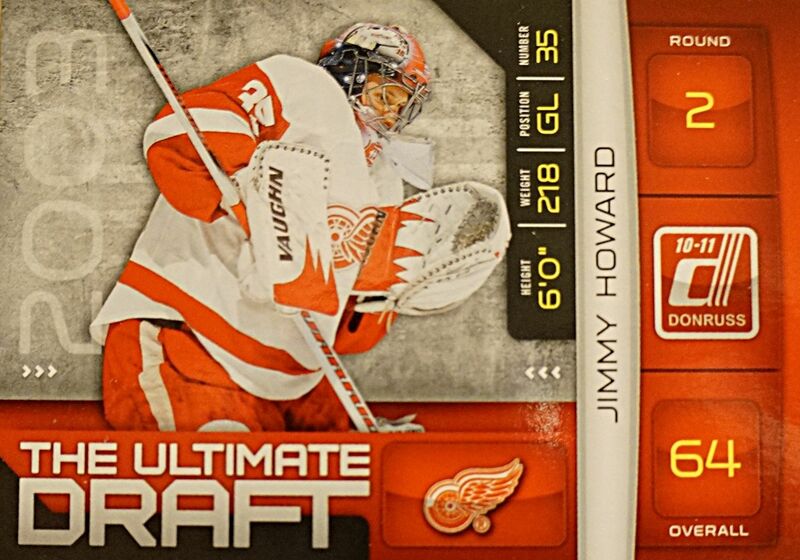 I usually don't like the look of the Ultimate Draft inserts, but this one works well with the Red Wings color scheme. 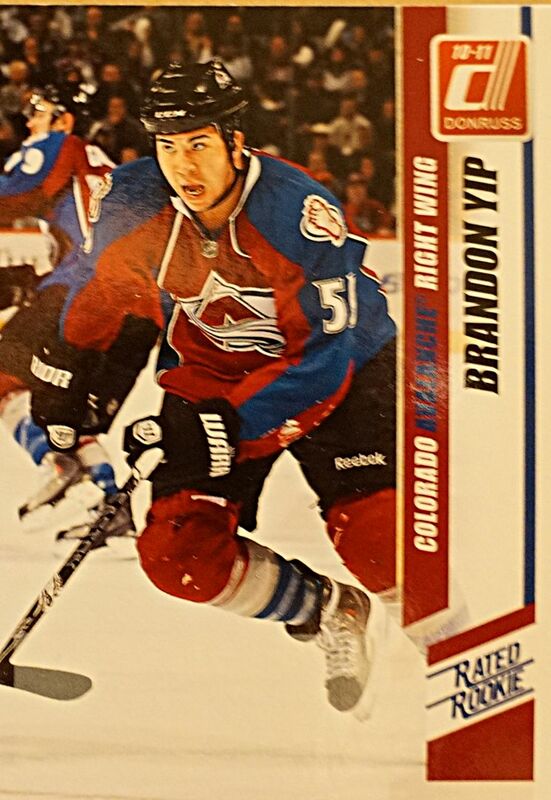 I sort of forgot about Brandon Yip, but remembered him right when I pulled this card. This Rated Rookie definitely isn't worth much, but it does bring back memories of a few people collecting him back in 2010. 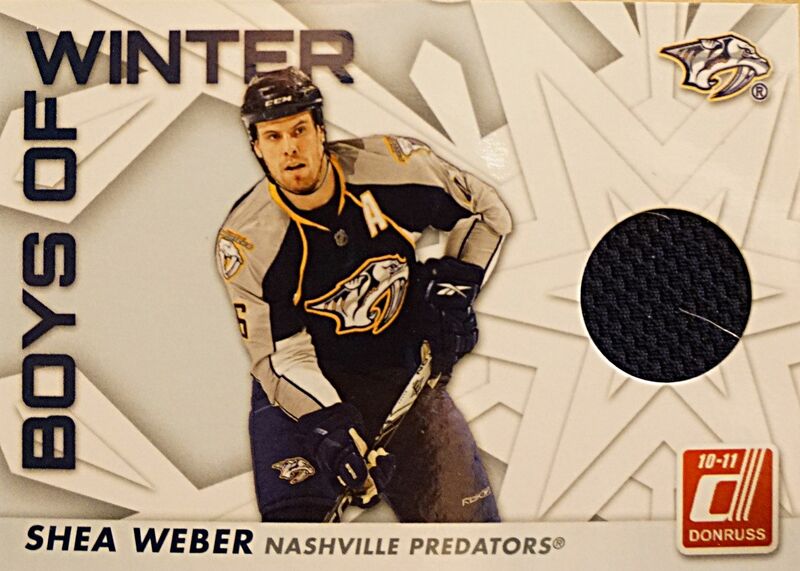 This Boys of Winter jersey card is good in that Weber is a good player and recognized name. Though it's just a jersey card, getting hits in retail blasters is always a good thing. 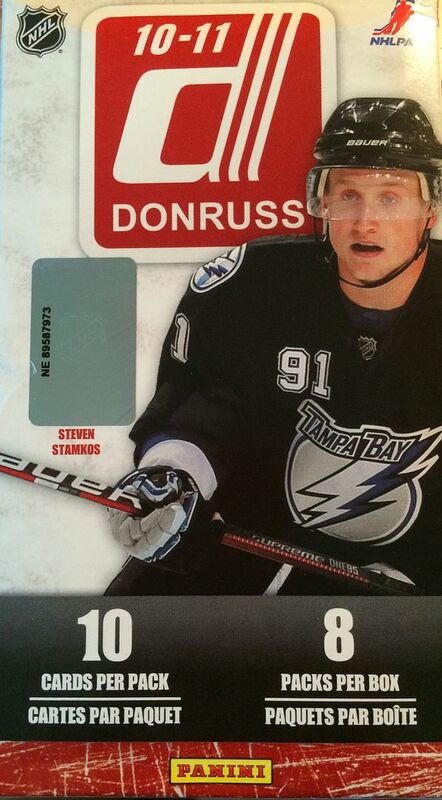 For under ten dollars you can get a very fun opening experience with Donruss. Sure, the product hasn't aged very well, and there is probably a few tons of it that were made, but none of that really detracts from the product - especially at that price. I'd recommend just about anyone to get in on this product if they want a nice little break during the week.